Moving to Chandigarh Football Academy in 2009 was seemingly the big ticket move a 13-year-old Lalruatthara was waiting for in his fledgeling career. KOCHI: Moving to Chandigarh Football Academy in 2009 was seemingly the big ticket move a 13-year-old Lalruatthara was waiting for in his fledgeling career. But his dreams were shattered when he was sent back home from the academy a year and a half later citing medical reasons. "I was told after the medical examination that I should go back. They never told me what the problem was. It wasn't just me either. A few other players were also dropped. It could have been financial difficulties. Anyway, I was very disappointed," Lalruatthara recalled. However, the young footballer was not one to sulk. He returned to his small village bordering Myanmar in the Champhai district of Mizoram and strung together his footballing career that was almost in tatters after the snub. And in little over three seasons later, he played every minute in Mizoram's historic 2014 Santosh Trophy triumph and during last season, was a vital cog of Aizawl FC that surprised one and all by winning the I-League -- the first club from North East to do so. India coach Stephen Constantine is also an admirer of the defender. "I am so happy to have been a part of both the sides. At Aizawl, the players were a close group and enjoyed playing football. Everything went well for us. It was a great season -- one that I will never forget in my life," said the youngster.Trophies seem to follow the left-back wherever he goes. 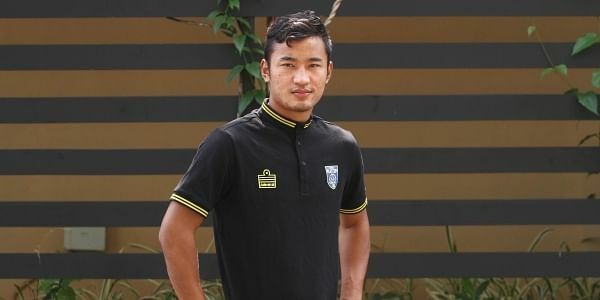 "Mizoram Premier League was the big break for me. I signed for Luangmual FC in 2012 for the inaugural season at the age of 17 and moved to Chanmari FC next year where I won the league," Lalruatthara, now a Kerala Blasters player, told Express on Wednesday. Ruatthara, as he is fondly known, is now learning from the best at Blasters. "As a Manchester United fan, I have watched Wes Brown and Dimitar Berbatov as a kid. Rene Meulensteen is a very experienced coach who has been at big clubs. The training is very professional just like at any big clubs elsewhere. I am learning and improving every day," said the defender whose role model is Nemanja Vidic. The 22-year-old has been solid at the back alongside Nemanja Lakic-Pasic, Sandesh Jhingan and Rino Anto -- a combination that has kept two clean sheets in the opening games of the season. "It is great to learn from players like them. They support me at the club while Sunil (Chhetri) bhai and Jeje (Lalpekhlua) bhai are helpful when I am away with the national team," he said. "The coaches and support staff at Blasters have been helping me. I am working on improving my close control, speed and agility. I love to defend as well as make overlapping runs to contribute to attack and I am pleased I have been able to do that in the two games so far," said Ruatthara. Ruatthara who was part of Delhi Dynamos in last season's ISL failed to get a start in the team. "It was disappointing not to play much, but the new season has started really well. Everybody loves football in Kerala, just like Mizoram, and I want to make the fans happy by helping the team win," he said.